(Brett Tingley) Something is afoot in southern England. 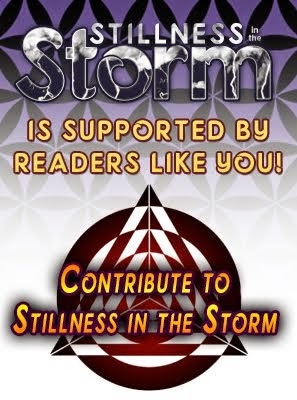 Scores of reports of UFOs, black helicopters, and other anomalous aerial phenomena have poured in over the last year. 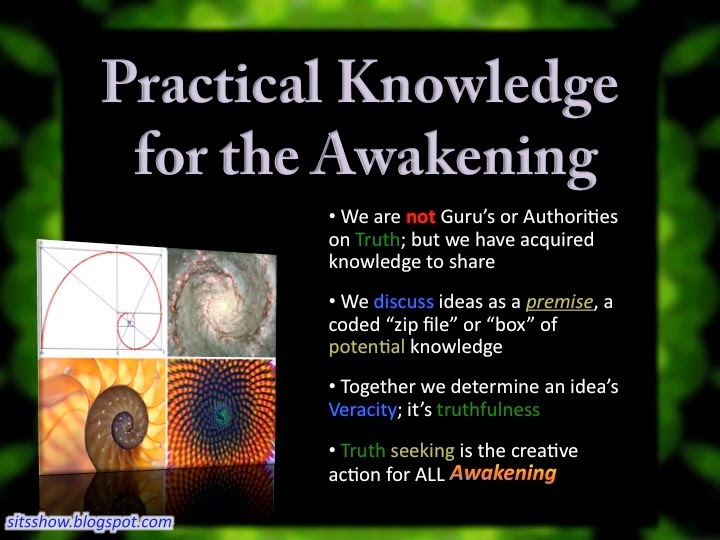 Many of these sightings have had multiple witnesses and/or photographic evidence. 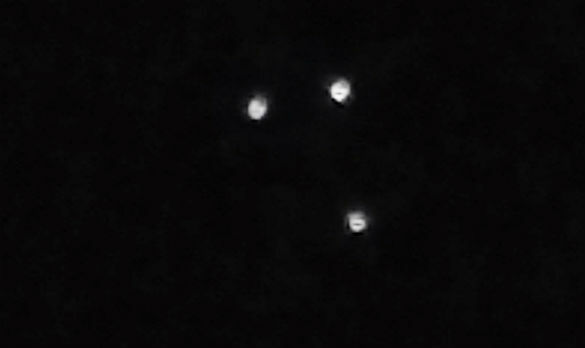 Interestingly, many of these sightings involve slow-moving triangle-shaped aircraft or triangular groupings of lights. There is a joint USAF/RAF base in the area, making military testing of secretive spy aircraft a likely explanation. However, there could also be a social or psychological element to the spate of sightings; as more individuals report sightings and receive publicity, more and more residents might be watching the skies with cameras ready to film any odd sights. Zoomed image taken from the footage. 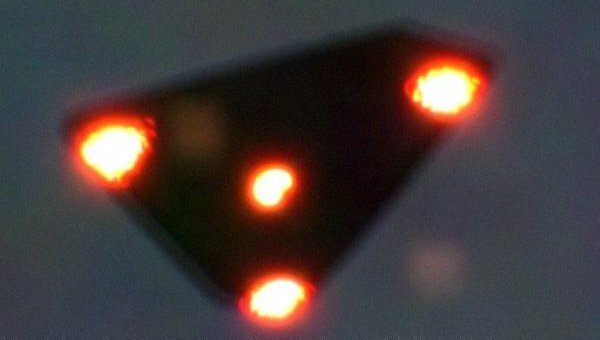 Whatever the cause of the rash of sightings is, a new video of strange lights in the sky shot in Exmouth, England appears eerily similar to other recent sightings of triangular aircraft. The footage was shot on the evening of April 17, 2017 by an on-duty bus driver and shows a trio of lights hovering slowly in the distance. I was just kind of walking about near the leisure center, where my bus stops, when I looked randomly over in the direction of the river, which is when I saw the three lights in a triangle pattern rotating on its axis and wobbling slightly. I have been interested in the subject of UFOs since I was about 10. I told my mate I’d ring him back and started filming the lights with my phone. 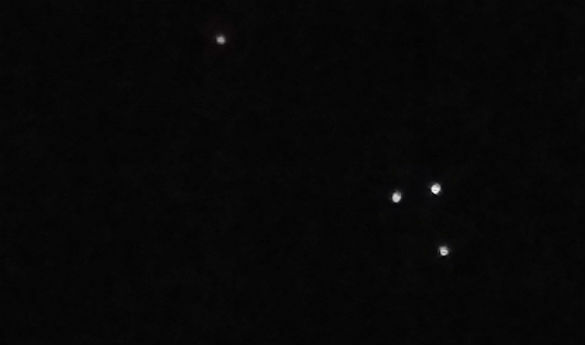 Due to the street lights my camera was having a hard time focusing on the formation. so I moved closer to the river to get a better view. It’s at this point I really had to go back to the bus stop to get my bus. Hmm… prior interest in UFOs, out-of-focus camera – all the trappings of a dubious sighting. However, given the relatively clear footage and the high number of similar sightings in southern England, the sighting is a bit conspicuous. The lights in the footage hover far in the distance beyond the capabilities of the witness’s camera. Naturally. [T]here was an interesting little hint that the Americans, too, were seeing these Flying Triangles over their territory. As we were making our inquiries, they turned the question around and wanted to know if our Royal Air Force had a triangular-shaped, hypersonic prototype aircraft of some sort. So, presumably, the Americans were having Flying Triangle sightings, too. Triangle UFOs aren’t just an English phenomenon, however. Flying triangles have been spotted around the world with increasing frequency lately. Recently declassified documents show that even the U.S. Nuclear Regulatory Commission has documented sightings of similar triangle UFOs which appeared to monitor American nuclear facilities. 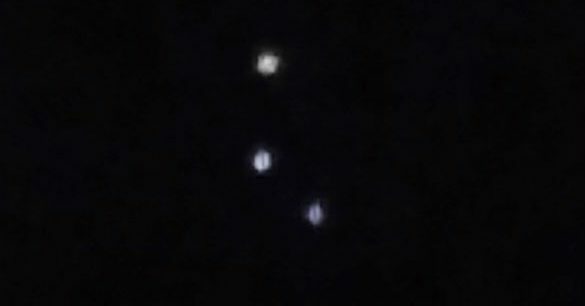 While many of us would love for these to be proof of visitors from another world, most theories suggest that these flying triangles are likely a form of undisclosed aircraft. Dozens of witnesses across Belgium reported sightings of the same triangle-shaped craft throughout 1989 and 1990. Whatever they are, one thing is for sure: the triangle is the new saucer.